For the Genesis compilation with the same name, see Action 52 (Genesis). This is the first game in the Action 52 series. 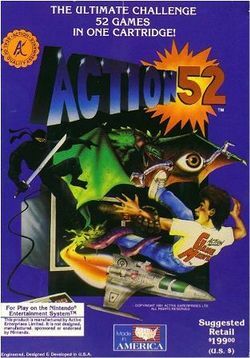 For other games in the series see the Action 52 category. Action 52 is the name of two unlicensed multicarts released by Active Enterprises. Each cart consisted of 52 individual and original video games. The first was released in September 1991 for the NES. The second was released for the Sega Genesis. A SNES version was advertised in some magazines, but never released. It initially retailed for the comparatively high price of US$199 (or "less than $4 for each game"), and became notorious among gamers for the abysmal quality of its games. Many video game collectors value Action 52 for its notoriety and rarity. The boxes state that the carts contain "52 'new and original' exciting games". The games cover a variety of genres, although the most common are scrolling shooters and platform games. Among the games is The Cheetahmen, Active's attempt at creating a franchise similar to the Teenage Mutant Ninja Turtles. This page was last edited on 25 June 2014, at 17:24.